I’m pregnant – we’re having another baby! I’m about halfway through my pregnancy already…I know, and I’m just sharing the news with you now. We’re very excited to round out the fam with a second child. Our little Z has absolutely no idea what’s happening even though we talk about it frequently. She does have a lot of love for babies when we see them so we are hoping she feels the same way later this year when one comes home with us for good. 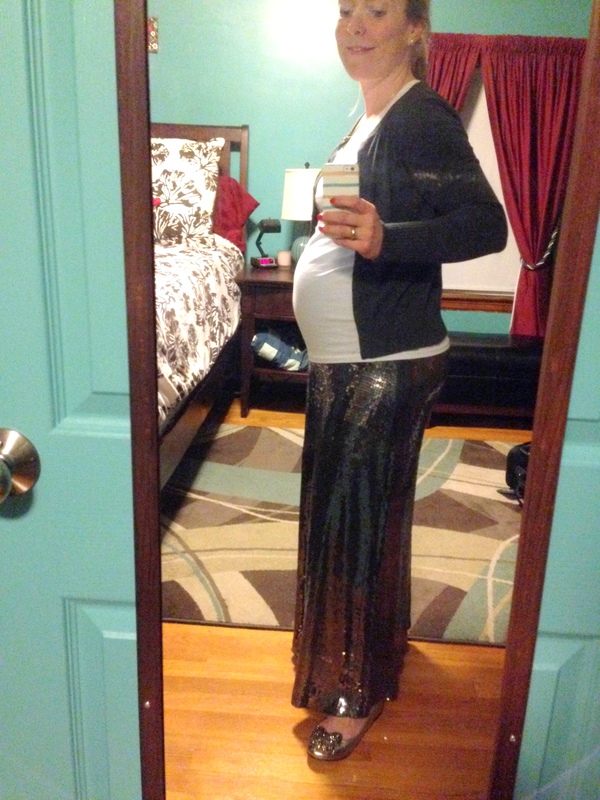 Gray sweater – Nordstrom (old, non-maternity), White tee – GAP Maternity (old but they always have a version of this tee for sale), Sequin maxi skirt – Michael Kors (TJ Maxx find, non-maternity but about 2 feet too long so I can wear it now over my bump and then shorten it to proper length once the baby is here), Sparkle bow shoes – Boden. Woohoo! Congratulations! That is such exciting news.